Good afternoon! We woke up to 55 degrees Fahrenheit this morning, what an amazing change for us over here in South Florida! Today I am sharing with you guys: The Trench Cape, a simple yet elegant garment, which has been seen a lot on the catwalks lately. What I loved about this trench cape was the belt, because it allows the possibility of accentuating our waist area. This light color cape can be worn with pants or skirts, for a modern and sophisticated ensemble. Do you like the effect it creates? 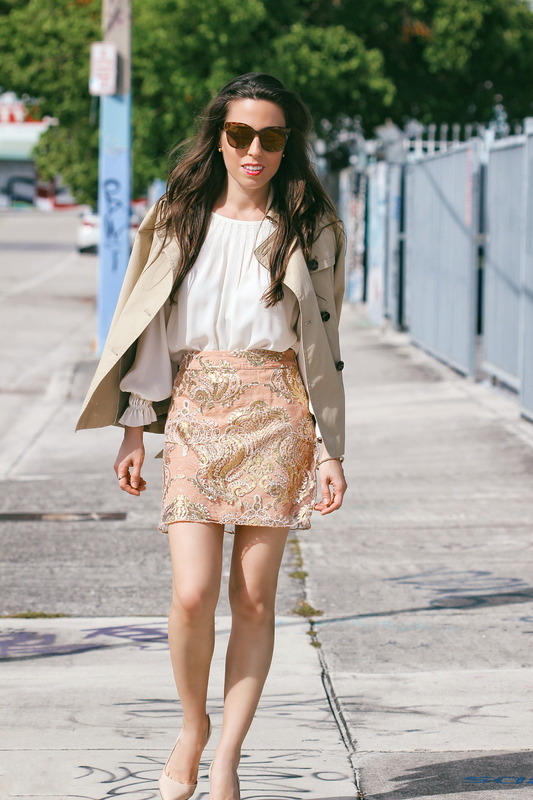 I recently wore mine with this light peach glittering skirt, and an off-white blouse that has the cutest and most delicate poet sleeves. This top comes in so many colors, you have to check it out! I plan on wearing it with navy / black / beige slacks for work, or with any of my pencil skirts. Buenas tardes! Hoy hemos amanecido con temperaturas bastante bajas, para lo que es Miami claro, apenas unos 12 grados. Asi que es apropriado compartirles el look de hoy: Las Capas, una prenda sencilla pero elegante, que se ha visto mucho en las pasarelas ultimamente. Esta capa me ha gustado mucho porque trae un cinturon que completa el look. 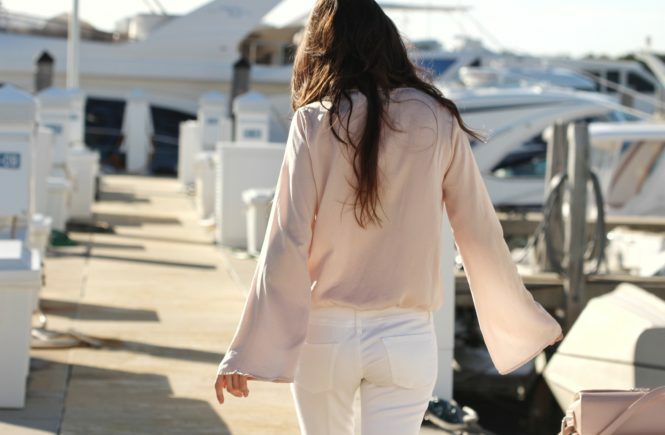 Las capas se pueden usar con pantalones o faldas, para armar looks modernos, sofisticados y con mucho estilo. Les gusta el efecto que crea? Me ha encantado como queda combinada con esta falda con lentejuelas muy pequenitas, y esta blusa elegante que trae unas mangas preciosas.